4. Why is this happening? 5. Why is this happening? Or, I started another blog. This one's called Nothing But Batman, and you can probably guess the topic. I wanted to talk about all eras of Batman and with the Silver Age focus of this blog I thought it was only fair to my readers to put the discussion of the Caped Crusader and his buddies over there. Hope you enjoy it! That Stan didn't want to burden Andru with the plot threads of the Spiderman series is pretty obvious. 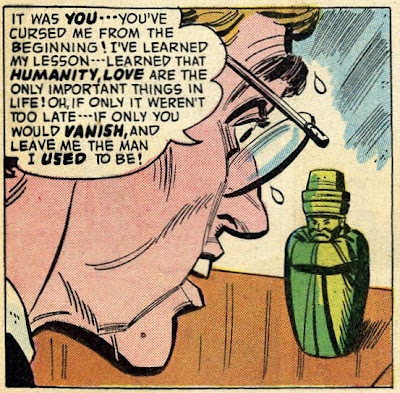 Nothing in the story places it tightly in any continuity of the time; this is a story that could be slotted in anywhere from about ASM 60-120 and nobody would notice that it was out of place. 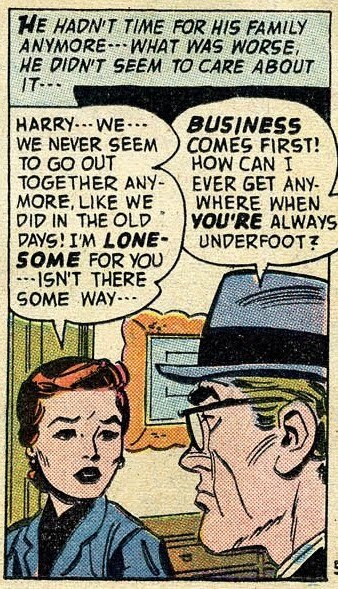 Harry and Peter are roomies, and Gwen is his girlfriend; that's about all we know. 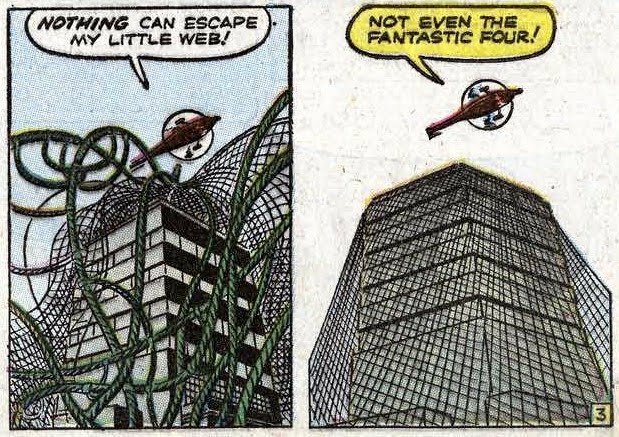 Fortunately, the crooks that Spidey has been following decide that discretion is the better part of valor, after a few efforts at killing off the wall-crawler, so he's able to survive the experience. Say what? 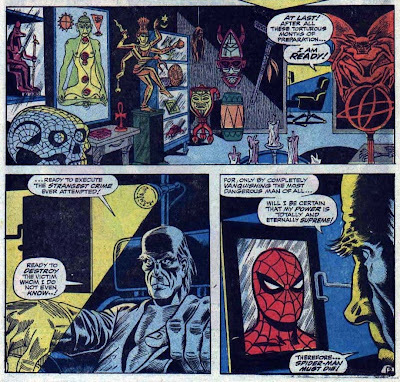 What was the point of sending Spidey down to New Orleans to face an android locked in a crate? He turns out to be something like the Sandman, able to turn himself soft or hard at will. So we get pages of them fighting, with Peter having to deal with his headaches at the same time. Causing a deadly feedback which kills the Sorcerer and renders his android harmless. Comments: Yechhhh! The story makes little sense. We can understand how the Sorcerer is able to affect Spiderman with his mental powers, but where did he come up with the android? Did he just buy it at Androids 'R' Us? 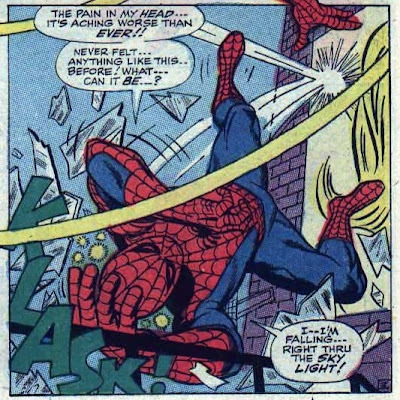 The idea of sending a package to Spiderman seems weird, as well, and if the object was to let the police know that he had killed Spidey, wouldn't leaving a return address on the object be a little too good a clue as to where to find him? 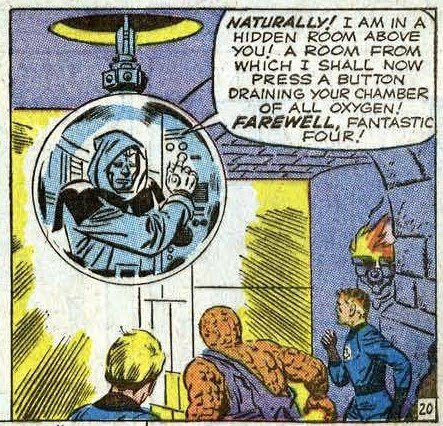 Fantastic Four Fridays: Let The Supervillain Team-Ups Begin! 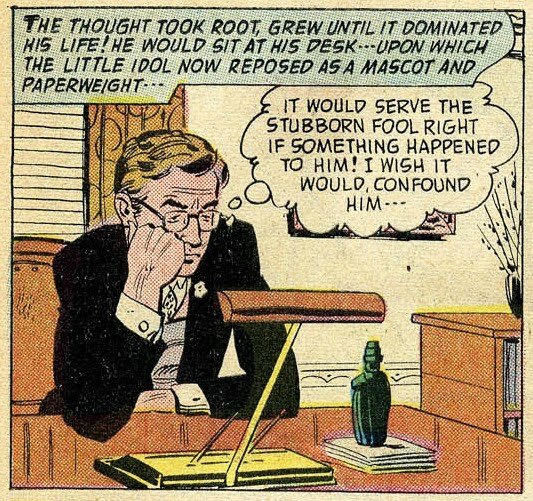 Supervillain team-ups had been rare in the DC Golden Age. Batman had two that I'm aware of; in Batman #2, The Joker Meets the Catwoman was published. 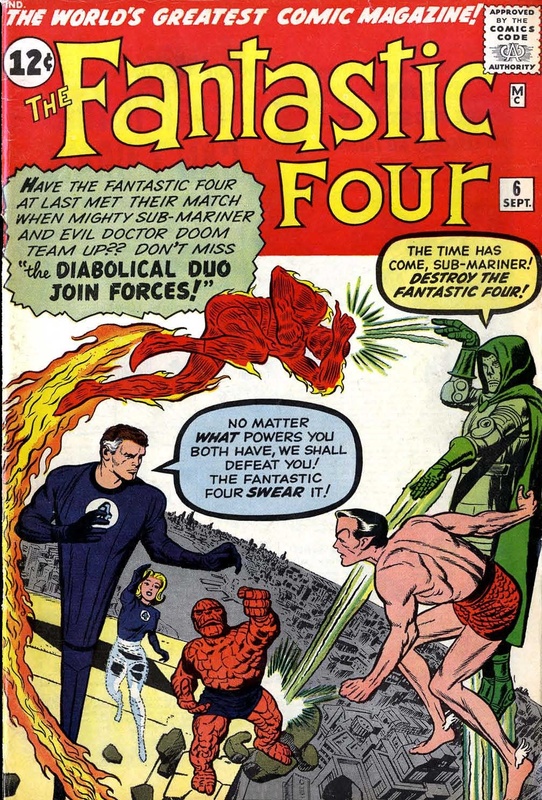 However, it was not really a team-up as such, just a story with two different villains. Then, in Batman #25, came Knights of Knavery, featuring the Joker and the Penguin. 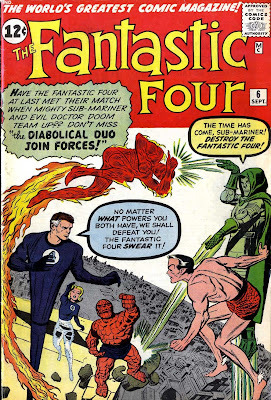 This was a real supervillain team-up; oddly it was not repeated. 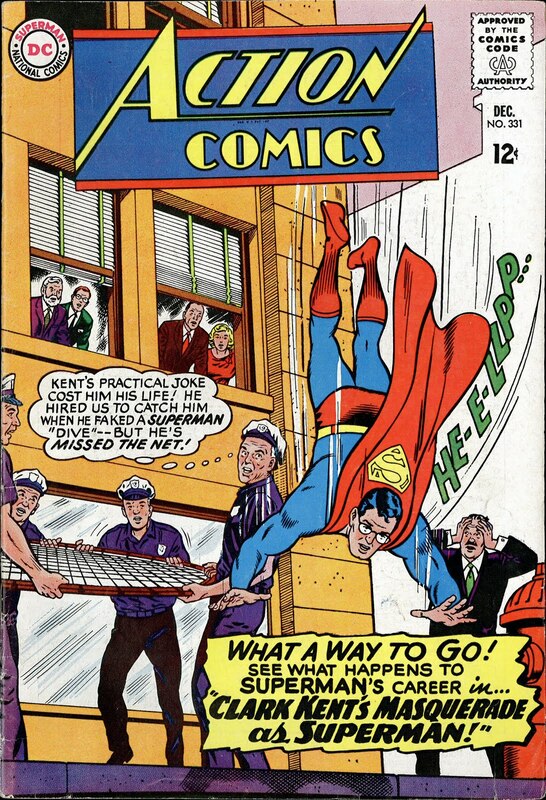 Superman #77 had a story featuring Luthor, the Toyman and the Prankster, and of course there were several supervillain team-up stories in All-Star Comics tales of the Justice Society of America. The famed Flash of Two Worlds (published exactly one year before FF #6) had featured the talents of the Fiddler, the Shade, and the Thinker. So team-ups were not unheard of, but they were uncommon. Of course, Marvel changed all that. As the story begins, the FF is reading their fan mail. 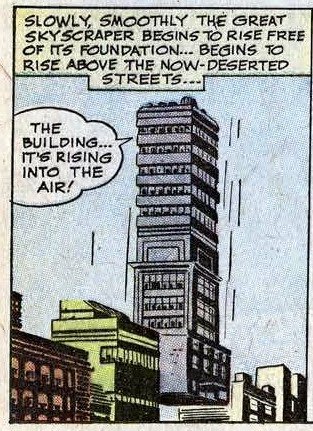 Reed discovers that a young fan is recuperating in a hospital nearby, and stretches over to meet him. 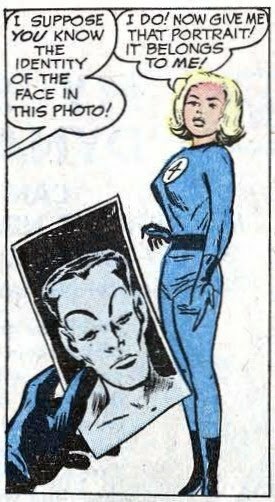 This gives Stan the opportunity to explain how Mr Fantastic's uniform elongates with him (some mumbo-jumbo about unstable molecules). Dr Doom tugs them out into space, apparently intending to suffocate them. The FF put on a bunch of fishbowls (although there are no apparent oxygen tanks attached to them), as does Subby. 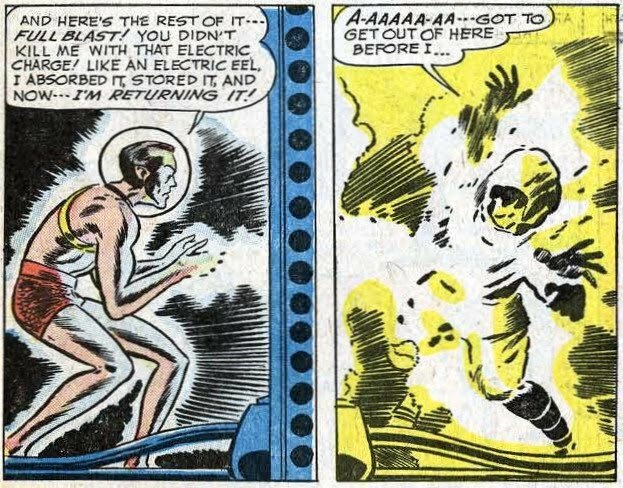 The Torch is unable to fly, and Mr Fantastic finds that the cold of space reduces his stretching power. Ben's strength and Sue's invisibility are useless. So what can be done? 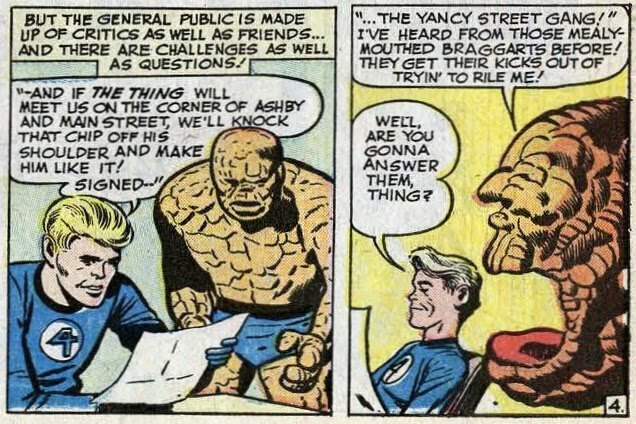 Comments: Something of an offbeat story; the FF only survives because one of the "villains" prevents the other villain from winning. 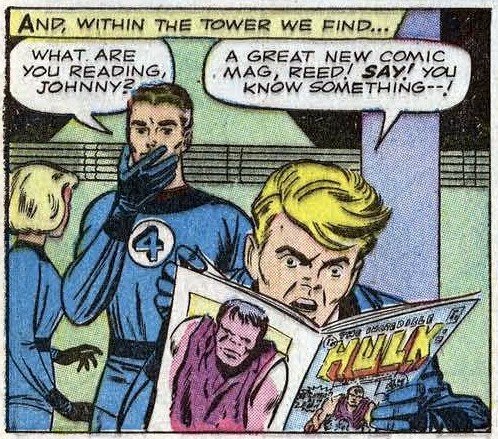 This became a common theme in the Marvel team-ups. Harry was an ordinary guy with work pressures and not enough money to buy the things he would like for his family. 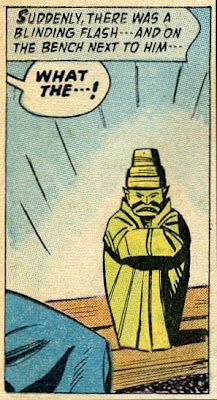 And sure enough, the idol disappears. 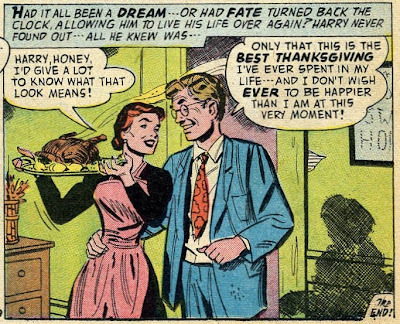 Harry leaves his magnificent estate behind, and wanders back to his old neighborhood. He sees boys playing and realizes that if he had not found that idol, his son would be out there with them. And then suddenly, there's Bobbie, running up to hug him! 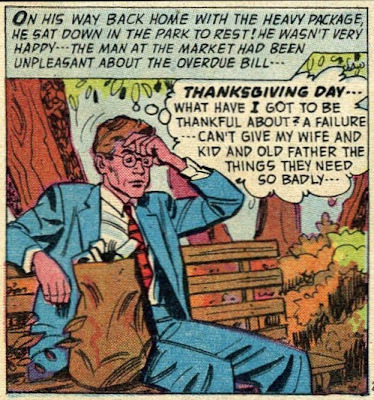 And his wife, and his dad, who found the Thanksgiving turkey on the park bench. Yep, somehow Harry's been transported back to the start of the story. Comments: Wow, what a terrific story! 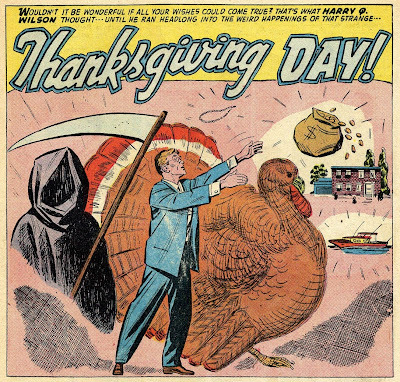 I confess, I got about halfway through it and wondered if it was going to be too depressing for a holiday post. 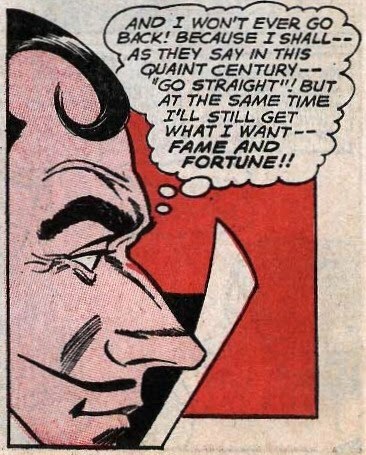 Stories like these, almost certainly from the fertile mind of Richard Hughes (who wrote and edited almost single-handedly the entire ACG line of comics) are why I consider American Comics Group to be the great unknown publisher of the Silver Age. 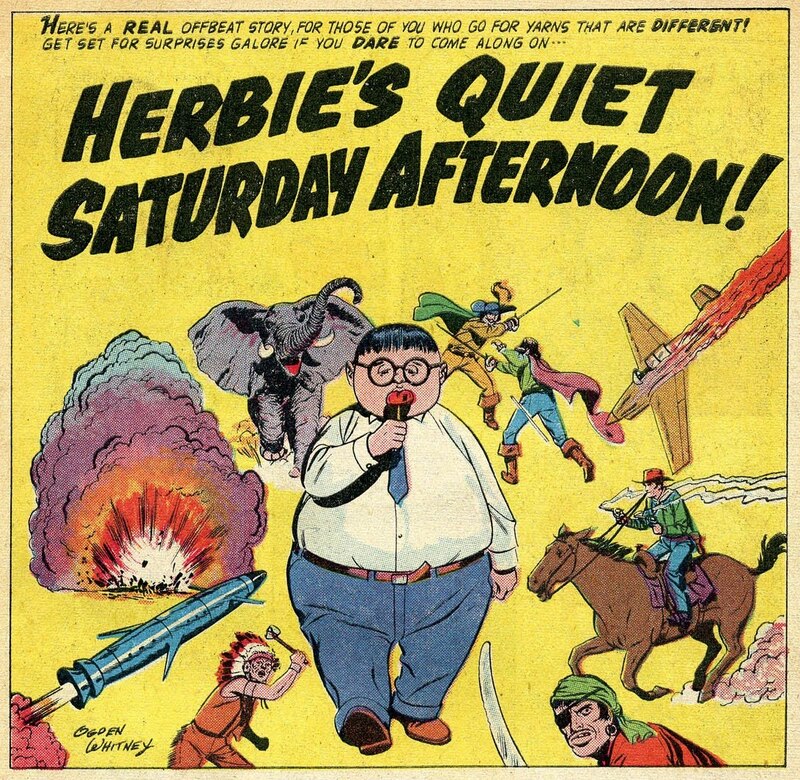 Yep, it's the first appearance of Herbie Popnecker, considered by many to be the greatest character of the ACG line. I've talked about the problem that DC faced with Superboy in the past. Essentially you've got a character whose adventures are happening roughly 10-12 years in the past; how do you avoid making him seem dull and behind the times? How can he be relevant to the youth of the 1960s and 1970s while constantly living with the trends of a decade earlier? 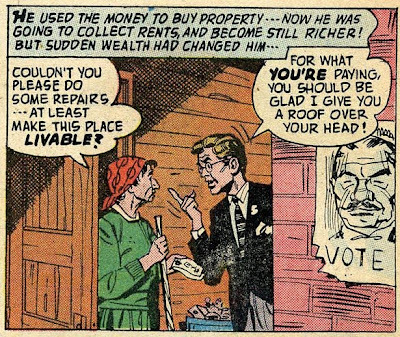 The problem was compounded by his earthly parents, Jonathan and Martha Kent. They were always portrayed as an elderly couple, childless, who happily adopted the baby Kal-El as the son they'd always wanted. But most children did not have elderly parents unless they (the kids) were tail-enders, late surprises in a mature family. So in Superboy #145, DC decided to do something about it. 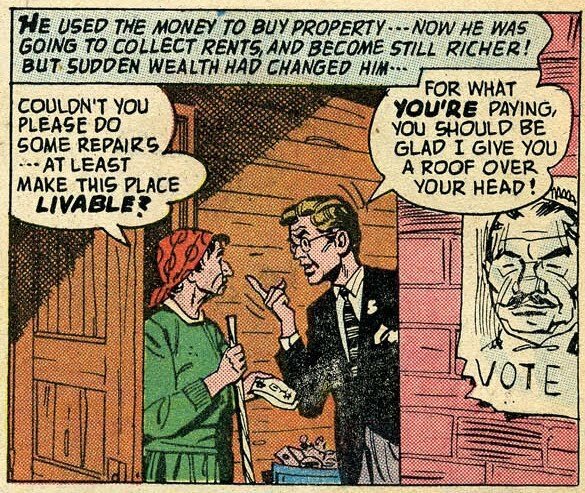 The Kents would be changed to a couple more fitting with DC's target demographic's parents, in their mid-late 30s. And in a slap at their readers they didn't even hide their reasoning. 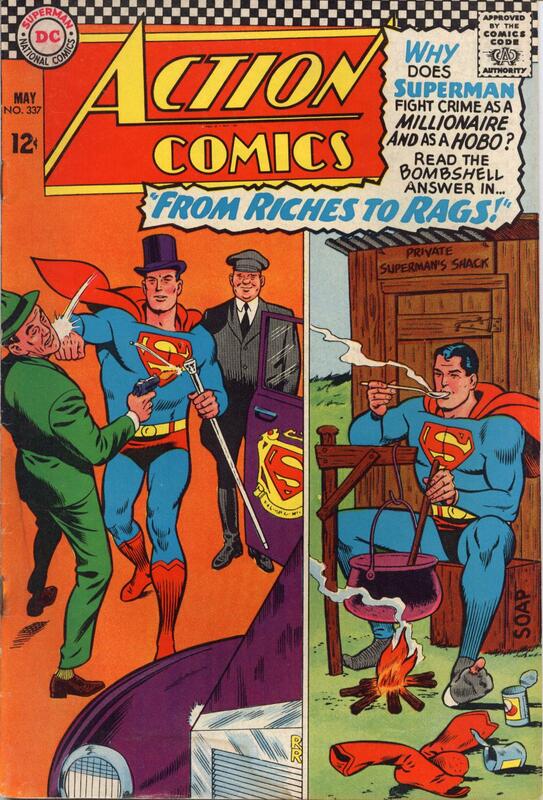 They postulated a world which waited eagerly for new instalments of a fictional character named Superboy. 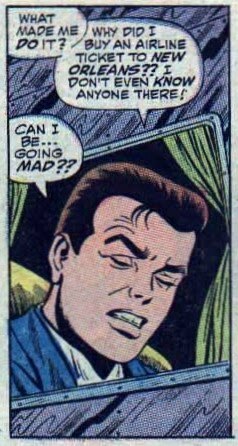 But (as you probably guessed) this world was not our own, since Superboy had "real" adventures there. No, it was a world in space where an unscrupulous producer was filming Superboy's adventures and selling them as dramatic entertainment. 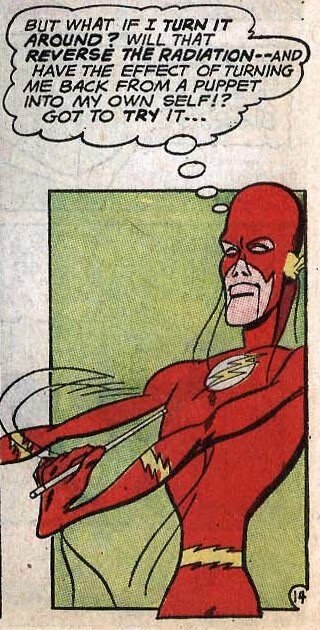 The results are a nice bit in an otherwise transparent attempt to make a major change to a significant character in the DC mythos. More important, it created just as many problems as it solved. Since the beginning of Superman, Clark Kent had never had a family as a young newsman in Metropolis. 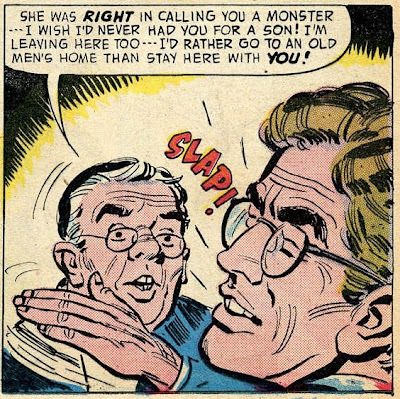 We never (almost literally never) saw his parents until the advent of the Superboy series; it was certainly understood that Superman had grown up as Clark Kent with an elderly couple, who had died. 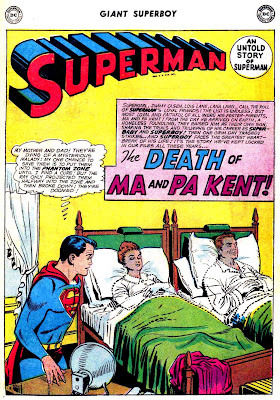 A few years prior to this story, DC had finally created the story where the Kents passed away, in The Last Days of Ma and Pa Kent. While vacationing in the Caribbean, the couple had found a buried chest. 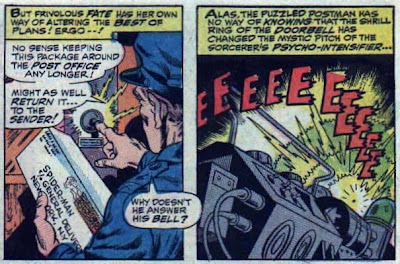 Superboy humors their desire to go back 250 years in time to see the chest initially being buried. Later, when they become ill, he mistakenly believes it's from eating a fruit they found in the past, but actually it was a virus contained in the treasure chest, so it wasn't Superboy's fault. But of course this actually makes the tragedy of their deaths even sadder. Strangest feeling, you say? You might look down at your feet and notice that you are being turned into a puppet! Comments: A pretty wacky tale, although as usual the Infantino and Giella artwork makes up for the weakness of the script. 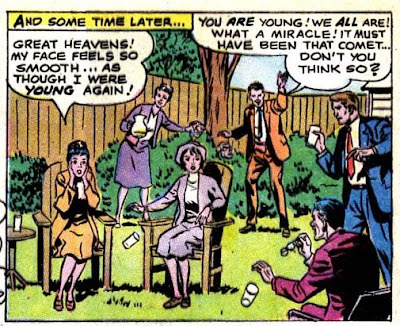 The backup story in this issue is the terrific Secret of the Handicapped Boys, which I reviewed awhile ago. 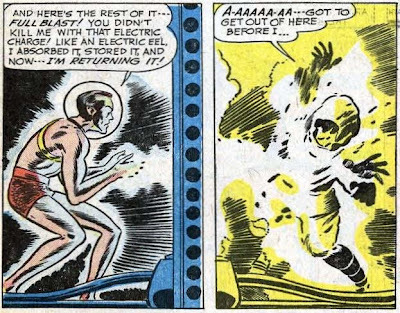 Adam Strange V1: Showcase 17-19, Mystery In Space 53-84 (Adam Strange stories only). Ambush Bug V1: DC Comics Presents 52, 59, 81, Supergirl 16, Secret Origins 48, Action Comics 560, 563, 465, Ambush Bug 1-4, Son of Ambush Bug 1-6, Ambush Bug Stocking Stuffer 1, and Ambush Bug Nothing Special 1. Aquaman V1: Adventure 260-280, 282, 284 and Detective 293-300, Lois Lane #12, Jimmy Olsen #55, World's Finest 125-129, (Aquaman stories only) Showcase 30-33, Aquaman 1-6. Aquaman V2: Aquaman 7-23, World's Finest 130-133, 135, 137, 139 (Aquaman stories only) and Brave & Bold 51. Aquaman V3: Aquaman 24-39, Brave & Bold 73, Jimmy Olsen 115 (Aquaman story only). Atom V1: Showcase 34-36, and Atom 1-17. 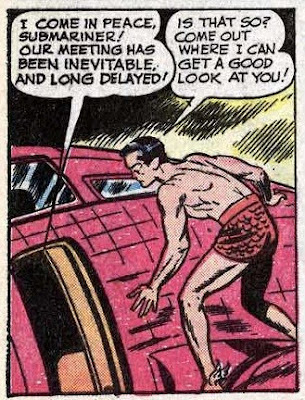 Atom V2: Atom 18-38, Atom-Hawkman 39-45 (Atom stories only). 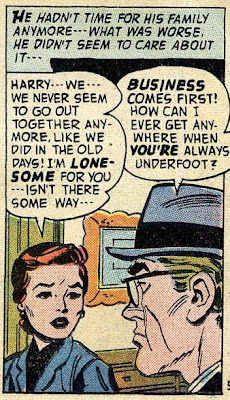 Batgirl, V1: Detective Comics #359, 363, 369, 371, 384, 385, 388, 389, 392, 393, 396, 397, 400, 401, 404, 405-424, Batman #197, Adventure Comics #381, World's Finest Comics #169 and 176, The Brave and The Bold #78, Justice League of America #60 and Superman #268 and 279. Batlash: Showcase 76, Batlash 1-7, DC Special Series 16, Jonah Hex 49, 51-52. Batman and the Outsiders: Batman and the Outsiders 1-19, Brave & Bold 200, New Teen Titans #16. Batman V1: Detective Comics 327-342 (Batman stories only) and Batman 164-174. Batman V2: Batman 175-188 (not including annuals 176, 182, 185 and 187) and Detective 343-358 (Batman stories only). Batman V3: Detective 359-375 (Batman stories only), Batman 189-192, 194-198 and 199-201. Batman V4: Batman 202-215, Detective 376-390 (Batman stories only). Booster Gold: Booster Gold 1-25, Action Comics 594. Brave & Bold Batman Team-Ups V1: Brave & Bold 59, 64, 67, 69-71 and 74-87. Brave & Bold Batman Team-Ups V2: Brave & Bold 88-109. Challengers of the Unknown V1: Showcase 6, 7, 11 and 12, and Challengers of the Unknown 1-18. Challengers of the Unknown V2: Challengers of the Unknown 18-37 (18 overlap?). 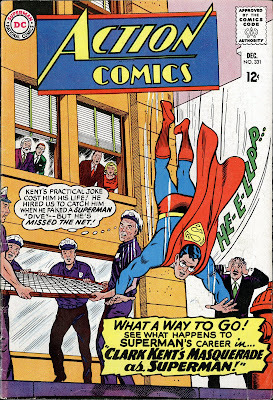 DC Comics Presents Superman Team-ups: DC Comics Presents 1-26. 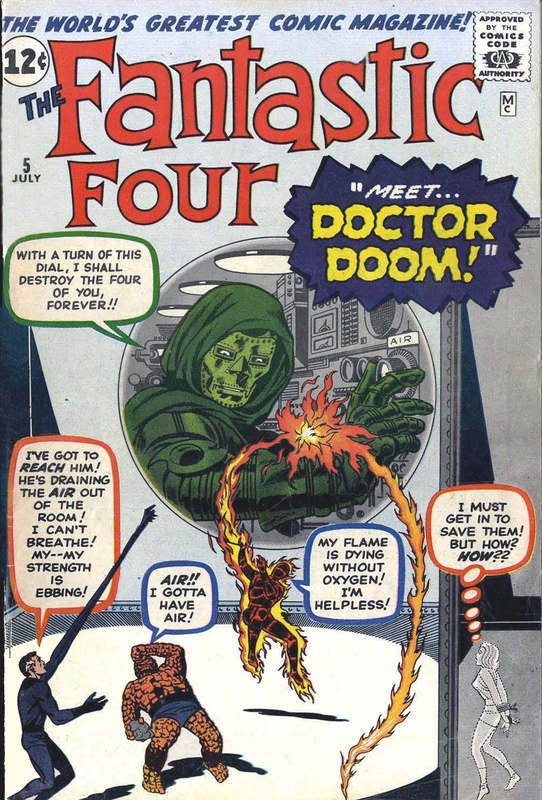 Doom Patrol V1: My Greatest Adventure 80-85, Doom Patrol 86-101, and Challengers of the Unknown 48. Eclipso: House of Secrets 61-80 (Eclipso stories only). 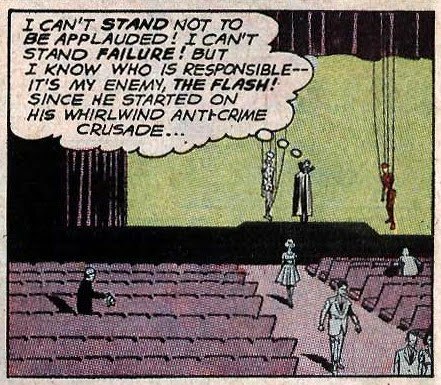 Elongated Man: Flash #112, 115, 119, 124, 130, 134, 138 and Detective Comics 327-371 (Elongated Man stories only). Enemy Ace: Our Army At War 151, 153, 155, Showcase 57-57, Star Spangled War Stories 138-152, 158, 181-183, 200, Detective Comics #404, Men At War 1-3, 8-10, 12-14, 19-20, Unknown Soldier 252-253, 260-261, 265-267 and DC Special 26. 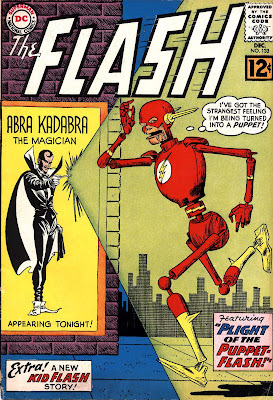 Flash V1: Stories not specified, but presumed to include Showcase 4, 8, 13-14, and Flash 105-119. Green Arrow V1: Adventure 250-266, 268-269 (Green Arrow stories only), Brave & Bold 50, 71, 85, Justice League of America 4, and World's Finest 95-140 (Green Arrow stories only). Green Lantern V1: Showcase 22-24 and Green Lantern 1-17. Green Lantern V2: Green Lantern 18-37. Green Lantern V4: Green Lantern 60-75. Haunted Tank V1: GI Combat 87-119, Brave & Bold #52 and Our Army At War #155. Haunted Tank V2: GI Combat 120-157. Hawkman V1: Stories not specified; presumed to include Brave & Bold 34-36, 42-44, and Mystery in Space #87-90, and Hawkman 1-11. Hawkman V2: Hawkman 12-27, Atom-Hawkman 39-45, Atom 31, and Brave & Bold 70. 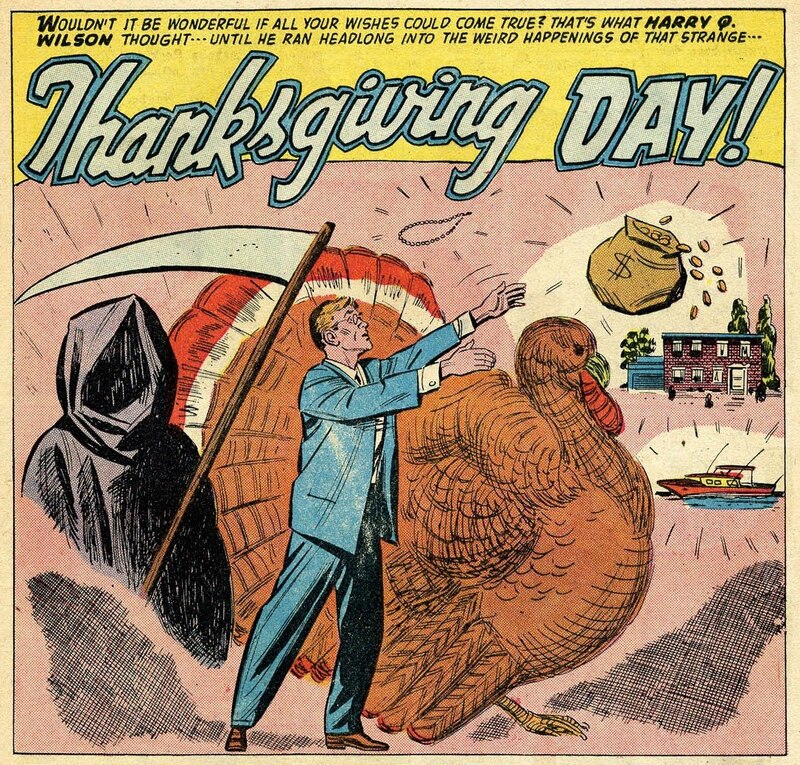 House of Mystery V1: House of Mystery 174-194. House of Mystery V2: House of Mystery 195-211. House of Mystery V3: House of Mystery 212-226. House of Secrets V1: House of Secrets 81-98. House of Secrets V2: House of Secrets 99-119. Jonah Hex: All-Star Western 2-8, 10-11, Weird Western Tales 12-14, 16-33. Justice League of America V1: Brave & Bold 28-30, JLA 1-16, Mystery in Space #75. Justice League of America V2: JLA 17-36. Justice League of America V3: JLA 37-60 (not including annuals 39, 48, 58). Justice League of America V4: JLA 61-83 (not including annuals 67, 76). Legion of Superheroes V1: Adventure 247, 267, 282, 290, 293, 300-328, Action #267, 276, 287, 289, Superboy 86, 89, 98, 117, Superman Annual #4, Jimmy Olsen 72 and 74 (Legion-related stories only). Legion of Superheroes V2: Adventure 316, 322-348, 365, Superboy 117, 125 and Superman Annual 4. (Seems to be some overlap there with V1). 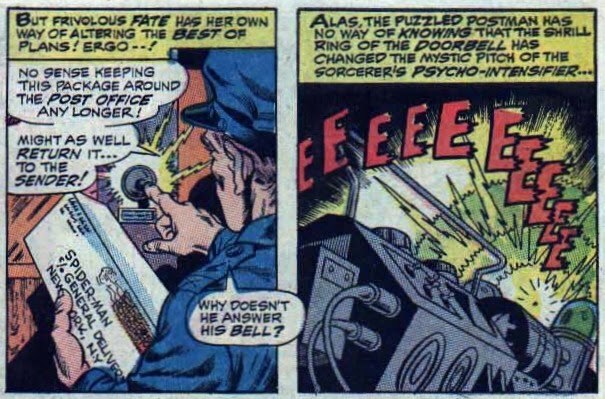 Legion of Superheroes V3: Adventure 349-368 (365 overlap?) 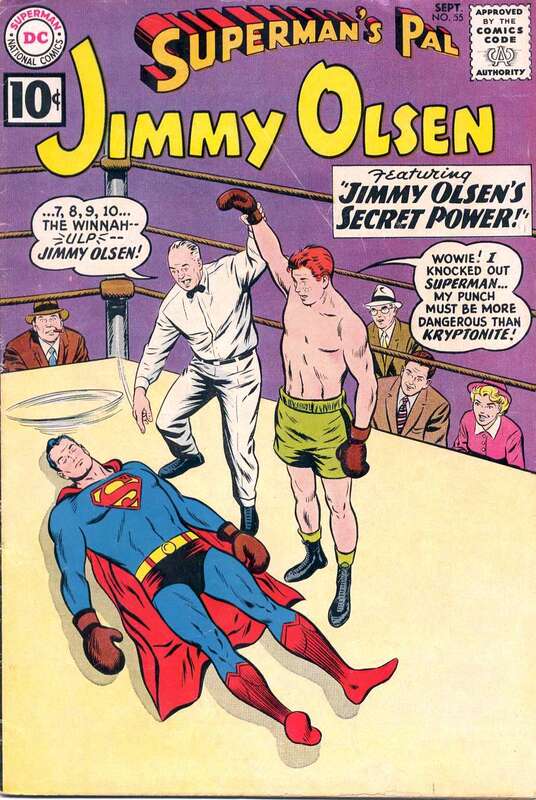 and Jimmy Olsen 116. Martian Manhunter V2: Detective Comics 305-326 and House of Mystery 143-173 (Martian Manhunter stories only). Metal Men V1: Showcase 37-40, Metal Men 1-16 and Brave & Bold 55. Metal Men V2: Metal Men 16-36 and Brave & Bold 66. 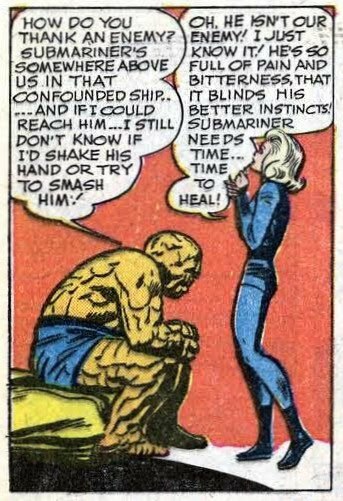 Metamorpho V1: Brave & Bold 57-58, 66, 68, Metamorpho 1-17, and Justice League of America 42. Phantom Stranger V1: Showcase #80, Phantom Stranger 1-21. Phantom Stranger V2: Phantom Stranger 22-41, JLA 103, House of Secrets 150, Brave & Bold 89, 98. Robin the Boy Wonder V1: Batman 184, 192, 227, 229-231, 234-236, 239-242, 244-246, 248-250, 252, 254, Detective 386, 390, 394-395, 398-403, 445, 447, 450-451, Jimmy Olsen 91, 111, JLA 50, 91-92, Teen Titans 14, Brave & Bold 83, 100 and World's Finest 195, 200. Secrets of Sinister House V1: Sinister House of Secret Love 1-4, Secrets of Sinister House 5-18. Sgt. Rock V1: GI Combat 68, Our Army At War 81-117. Sgt. Rock V2: Our Army At War 118-148. 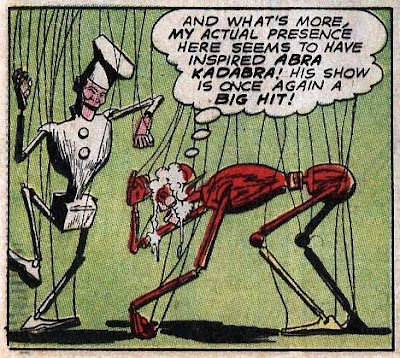 Strange Adventures V1: Strange Adventures 54-73. Supergirl V1: Action Comics 252-282, Jimmy Olsen 40, 44, 46, 51-52, Adventure 278, Superboy 80, Lois Lane 14, Superman 123, 139-140, 144. Supergirl V2: Action 283-321 (missing 282? ), (Supergirl stories only). Superman V1: Superman 122-133 and Action Comics 241-257 (Superman stories only). Superman V2: Superman 134-145 and Action Comics 258-275 (Superman stories only). Superman Family V1: Jimmy Olsen 1-22, Showcase 9. 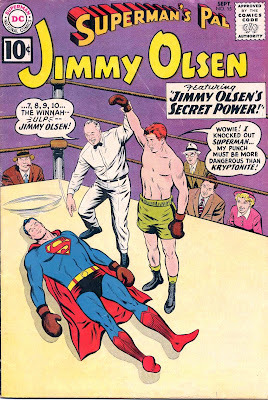 Superman Family V2: Jimmy Olsen 23-34, Showcase 10, Lois Lane 1-7. 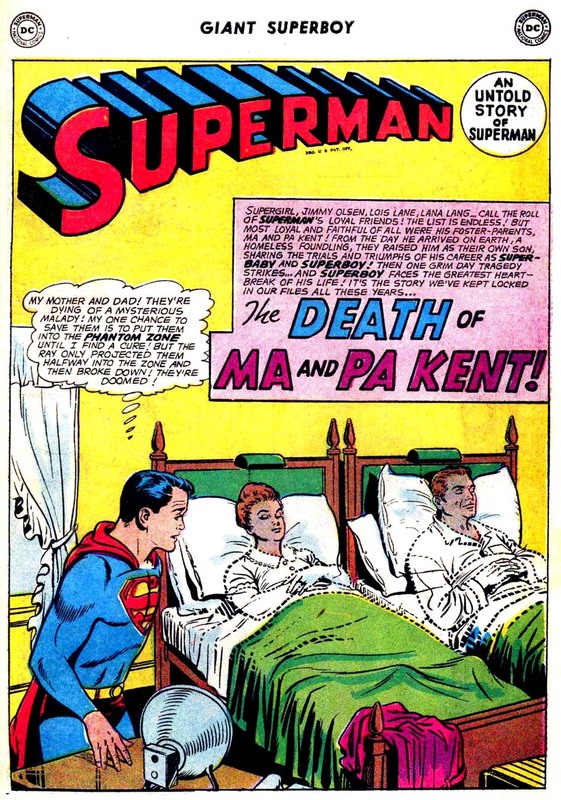 Superman Family V3: Jimmy Olsen 35-44, Lois Lane 8-16. 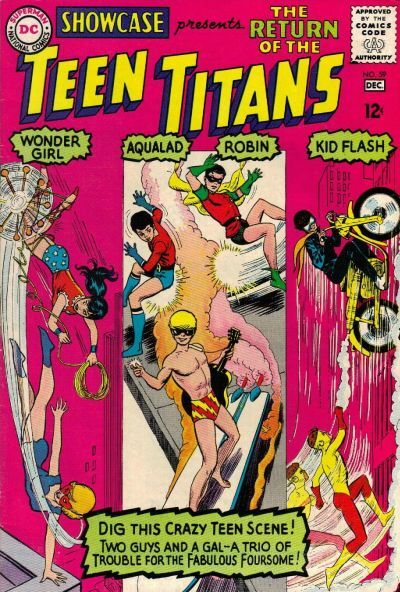 Teen Titans V1: Brave & Bold 54, 60, Showcase 59, Teen Titans 1-18. Teen Titans V2: Teen Titans 19-36, Brave & Bold 83, 94, and World's Finest 205. Unknown Soldier V1: Star Spangled War Stories 151-190 (Unknown Soldier stories only). Warlord: 1st Issue Special 8, Warlord 1-28. War that Time Forgot: Stories not specified, presumed to include the Star Spangled War Stories featuring WWII soldiers and dinosaurs. Wonder Woman V1: Wonder Woman 98-117. Wonder Woman V2: Wonder Woman 118-137. Wonder Woman V3: Wonder Woman 138-156. World's Finest V1: Superman 76, World's Finest 71-111 (Superman-Batman team-up stories only). World's Finest V2: World's Finest 112-145 (Superman-Batman team-ups only). World's Finest V3: World's Finest 146-173 (Annuals 161 and 170 not included), (Superman-Batman team-ups only). Update: Thanks to commenters Lito S and Jim for corrections to the Aquaman and Supergirl entries, and to JJ for going to the trouble to find out all the Batgirl stories! Aaron at Silver Age Gold covers the meeting of Tomahawk and several troglodytes and points out in a very interesting aside, why the revolutionary war character should not have known that they would be called cavemen. You learn something new every day! Jacque at Sequential Crush covers the ironic story of a gold-digger who missed her Prince Charming. Love that little "Oh!" at the end of the story. I've added a few new blogs to the sidebar. 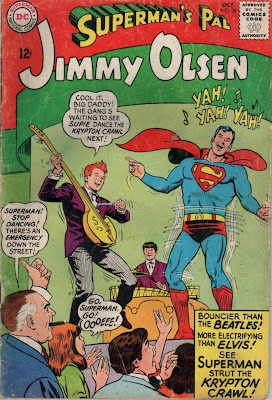 Al Bigley (Big Glee) covers comics nostalgia, and also seems to be a big fan of the Monkees (and who isn't?). I have "Last Train To Clarksville" on my MP3 player more or less permanently. Ian Sokoliwski, a professional comic artist, has his own blog. Check out his photos from the Central Canada Con. Lots of very attractive gals in costumes, what's not to like? 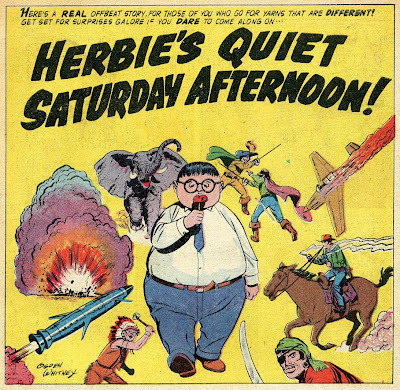 Joyville is another artist's blog, dedicated to appreciation of some of the more cartoony artists, who don't get enough recognition these days. Check out his post on Sheldon Mayer and Dizzy Dog. Hey! I thought Dial B for Blog had disappeared, but apparently it's back on the web. 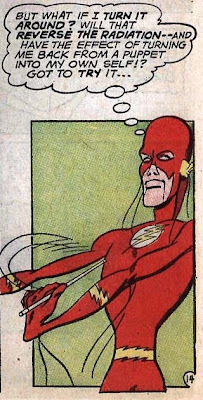 Go check out the greatest comics blog that ever was, or ever will be. 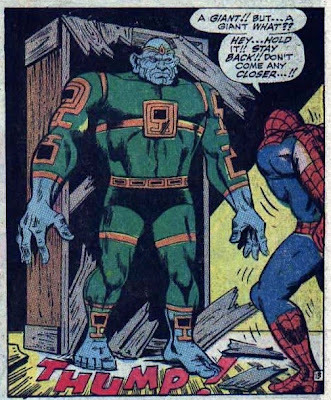 What do Dr Doom and the Green Goblin have in common? Answer at the end of the post. 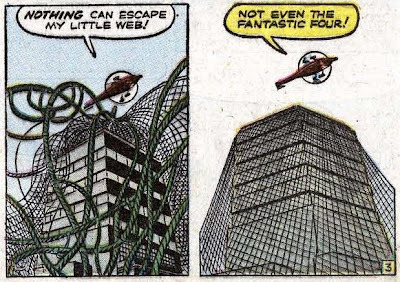 He calls out to the FF via a loudspeaker in his helicopter, and Reed recognizes the voice. 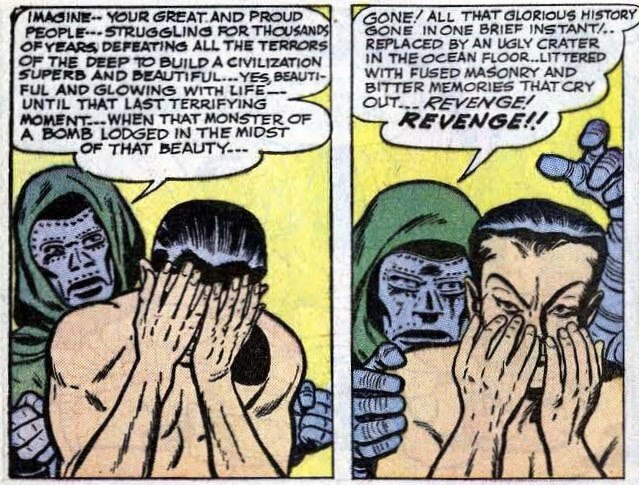 It's Victor Von Doom, a former college classmate of Reed's who was into black magic. 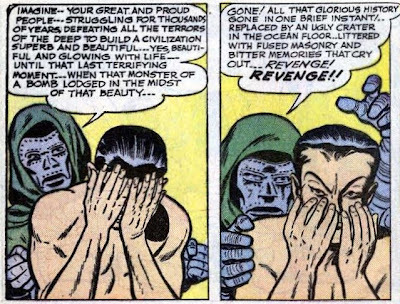 Reed tells the story of how Von Doom's experiments went awry, disfiguring the latter's face. Back in the present, Doom demands that the FF surrender Sue as a hostage. 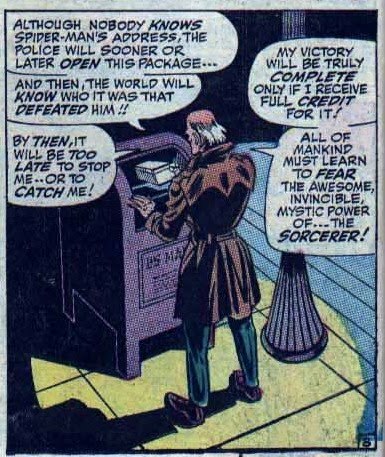 They initially resist, but it becomes obvious that the villain has all the cards, and Sue submits to his control. 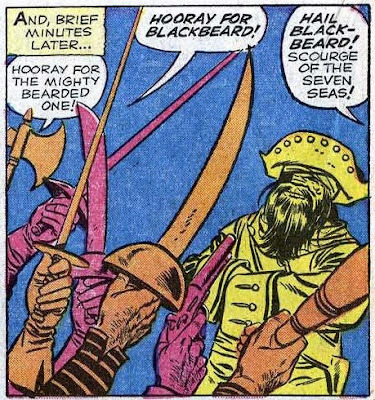 Doom demands that the other three members of the FF go back into the past and retrieve Blackbeard's legendary treasure. 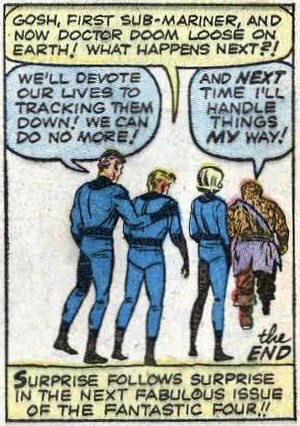 They agree, but only after he promises to free Sue if they do not return. 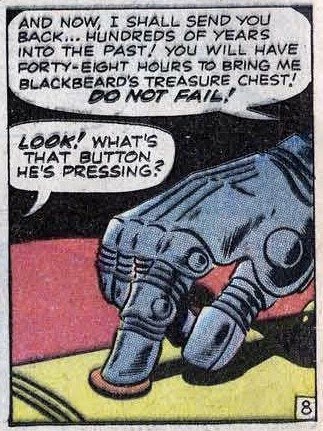 Oh, did you say, "treasure chest", instead of "treasure"? Reasoning correctly that there must be something powerful within the chest, Reed distributes the treasure to the men, while filling the chest with worthless chains. But there's one slight hitch; Ben has discovered his true calling as a leader of pirates and doesn't want to go back to the future. 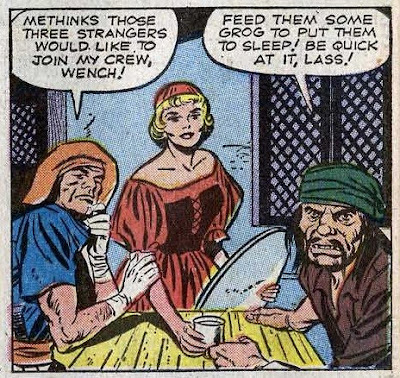 But when he sets Reed and Johnny in a lifeboat and sails into a hurricane, the three of them end up on a deserted island with the treasure chest. 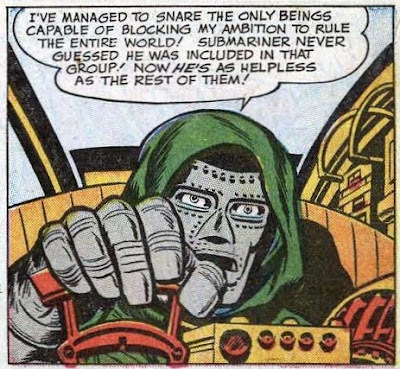 And so Doom calls them back to their own time. Comments: Everything works well in this issue, although for the most part the Marvel heroes eschewed time travel stories, a marked distinction between them and the DC lineup. 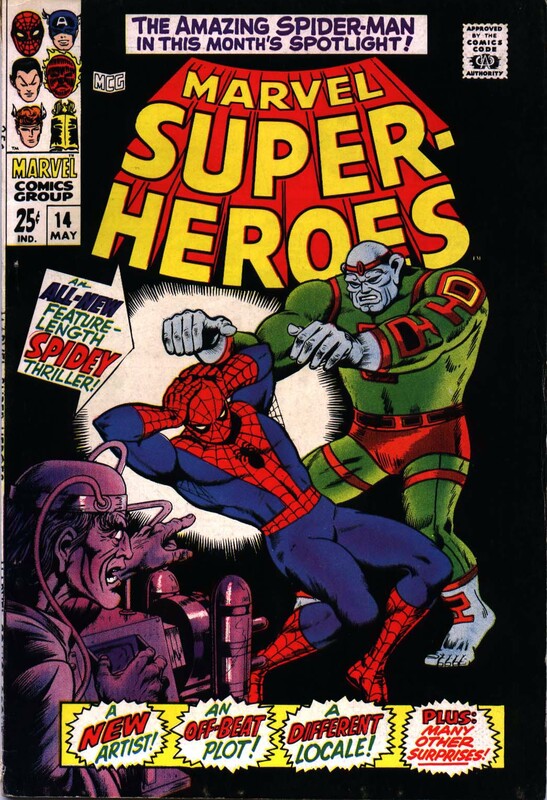 Coming up next: the first super-villain team-up of the Marvel era! Answer: Doom and Gobby both start out determined to defeat their respective superhero enemies. 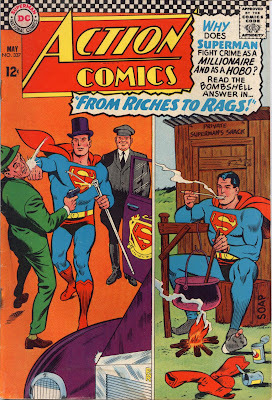 Most other villains start out as simple crooks and only when defeated by a superhero decide to exact revenge.